The timeless Biz Markie, the famed ''Clown Prince of Hip Hop'' is one of the classic artists of hip hop's golden age. Markie's reputation for playful and mischievous lyrics as well as beat-boxing skills made him a mainstay of hip-hop culture and a television personality. The Biz Never Sleeps is considered a standard among golden age hip-hop music, and is a definite must-have for any fan of genre. More than just a classic in the old school hip-hop pantheon, The Biz Never Sleeps is Biz Markie's biggest success as a rapper. A certified Gold album, it peaked at #66 on the Billboard 200 charts, and #9 on the Top R&B/Hip-Hop charts in 1989. It also features Markie's famous hit ''Just A Friend'', which peaked at #9 on the Billboard Hot 100 charts, was named VH1's 100th Greatest Song in Hip-Hop, and has been covered by numerous artists, from Justin Timberlake, to Mario, to jam band Umphrey's McGee. 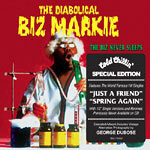 Released for the first time ever in an extended format this issue comes housed in a handsome 6 panel digipak and features never before seen photography from original Cold Chillin' art director and photographer George DuBose as well as 12'' versions and remixes of the hit singles ''Spring Again'' and of course ''Just A Friend,'' all perviously never available on CD format.